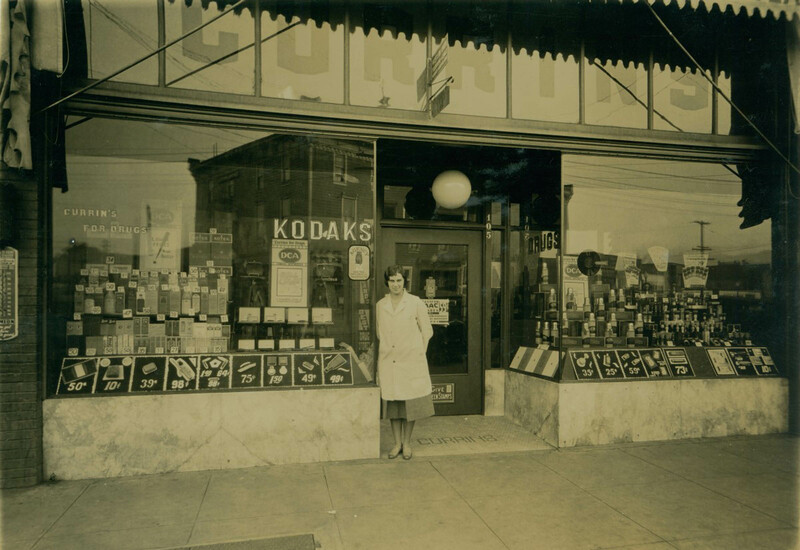 Currin’s Drugs was located in St. Johns at 105 Philadelphia in this 1932 image; the photo is identified as being 7334 N. Philadelphia by today’s street numbering. An unknown itinerant photographer captured this scene and the era and photo style leads me to think this may be the same photographer who took the shots of our still unknown shops from a couple of weeks ago. We’ve seen this intersection before but that was in photos from the 1930s. 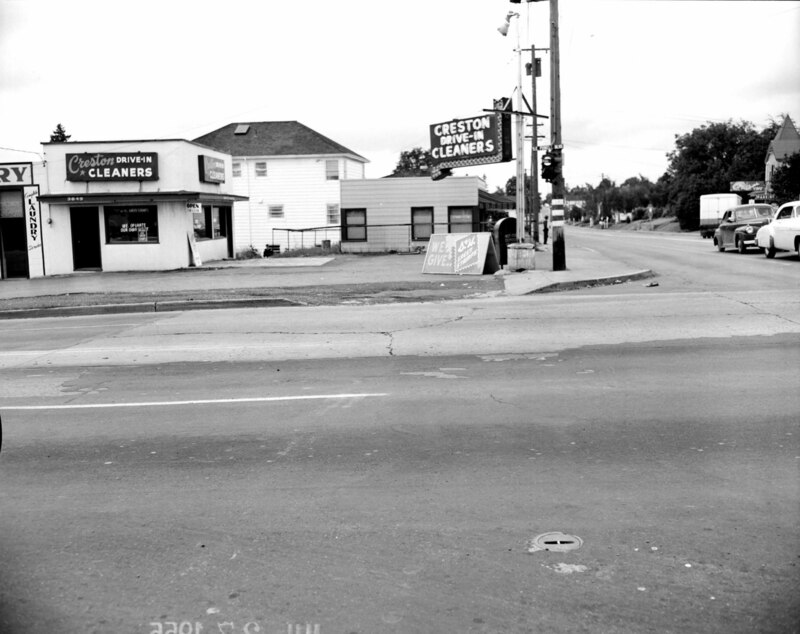 This time we see the Creston Drive-In Cleaners on the northwest corner of SE 39th & Powell in 1955; we’re looking north here. The little building facing 39th is apparently still with us, as is the apartment building beyond. 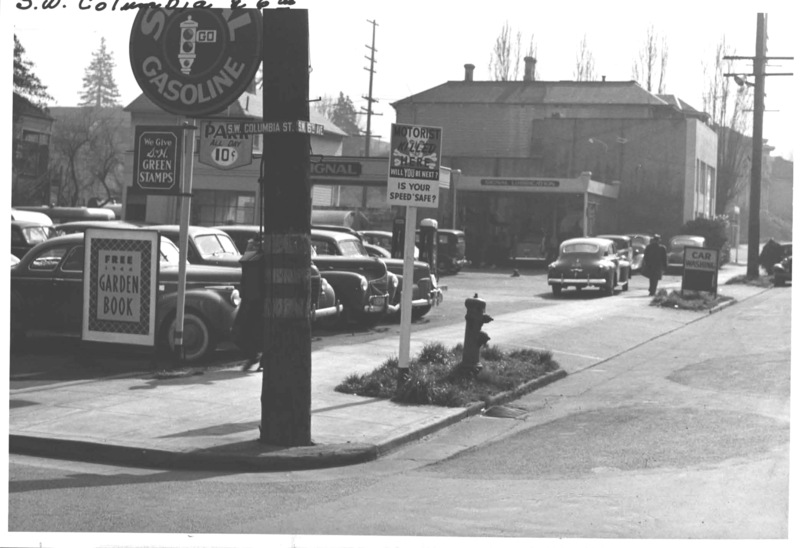 The Chevron station is gone now but there’s much in this Sellwood area that’s still recognizeable over 50 years later. Here we’re looking west on SE Tacoma at 13th Avenue. 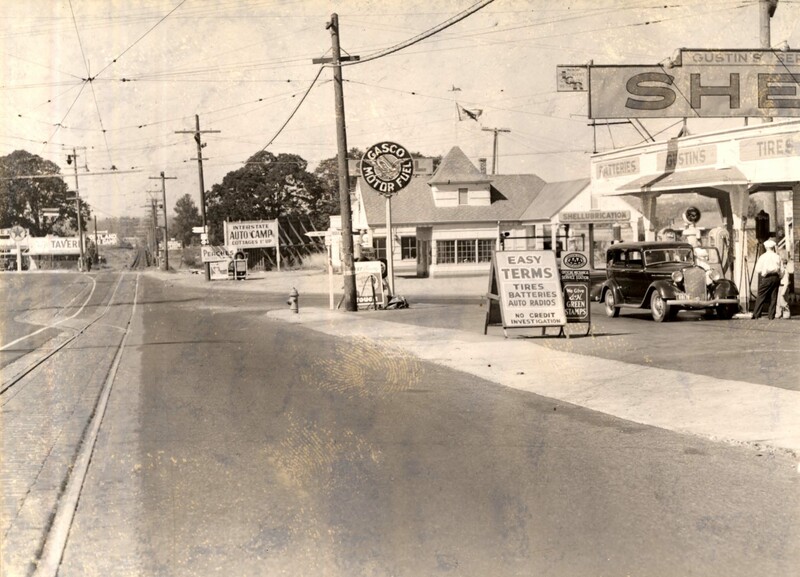 The Parkrose Bowl, a grocery shop, a bank, the Parkrose Theater and a hardware store across the street gave the intersection at NE Sandy and 100th Ave. a real neighborhood feel. I’m not sure anything in this photo survived to see the 21st century. This view looks east on Sandy. 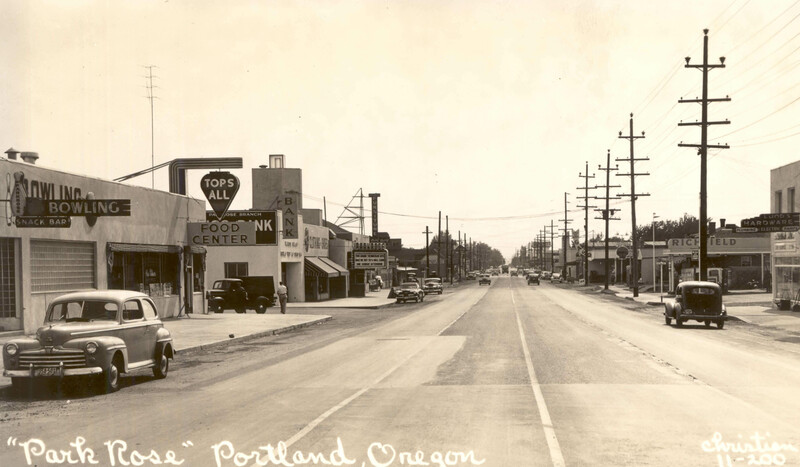 The Union Avenue streetcar tracks come to their northern limit at NE Columbia Blvd before turning west to Williams Avenue in this 1937 photo. 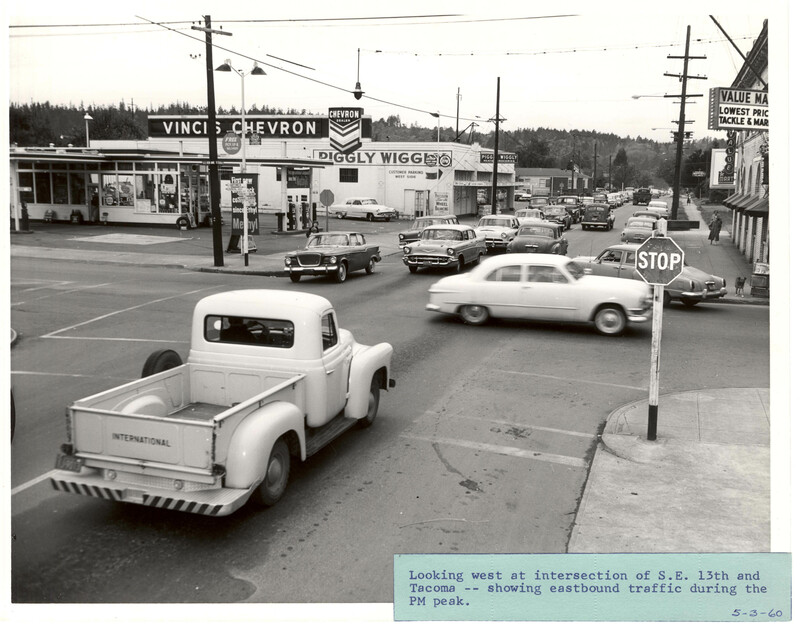 It was a very auto-centric location; Gasco, Shell and Texaco on the three visible corners, and the competing Interstate and Portland auto camps just up the road. All-day downtown parking for a dime? My, how things have changed since 1944. The Hotel Modera occupies this corner now.